Wireless network testing composes about a third of the ~$20B global electronic test & measurement market, spending that has been flat over the past three years. We believe that 5G investment by carriers will significantly exceed current market expectations, as competitive pressures in many global markets have created a “prisoner’s dilemma” that will compel them to step up spending. (http://www.ssrllc.com/publication/ 5g-rising-global-carrier-competition-to-drive-capex/) The complexity of 5G technology – much broader spectrum use, massive MIMO, beamforming antennae, IoT connectivity, etc. – adds to the competitive imperative for carriers, further supporting upside demand for wireless network testing solutions. Within the testing market, there has been a strong architectural swing toward modular solutions that can operate on a standard PC platform, and for more of the functionality to be coded in upgradeable software, rather than firmware. This has been a benefit for the biggest competitors – KEYS, Rhode & Schwartz, Anritsu, NATI, VIAV, etc. These stocks have rebounded strongly over the past year from their cyclical trough, but we believe estimates remain muted vs. the further upside sales likely to be generated by 5G demand, while valuations are still modest compared to other tech sectors. Wireless test equipment is ~1/3 of the $20B global T&M market. Global demand for electronic test and measurement equipment – critical in R&D, in precision manufacturing, in process monitoring and in network deployment – has been stagnant over the past three years. Improving performance in the most recent quarters suggests a cyclical turn and the stocks have responded, up 48% on average over the past 12 months. The largest end market is commercial telecommunications, with testing equipment for wireless networks making up roughly 35% of industry sales. We believe that consensus expectations for the sector fail to account for likely upside in this segment. Carrier rivalry will force upside industry capex. Based on carrier guidance, industry analysts forecast little spending growth from 5G, suggesting that investment in new networks can be accommodated by reducing other spending. We believe that this is wishful thinking – competitive pressures that are already driving down ARPUs and operating cashflow create a “prisoner’s dilemma” for carriers that will force them to rollout 5G much more aggressively. (http://www.ssrllc.com/publication/5g-rising-global-carrier-competition-to-drive-capex/) The benefits of 5G – higher cell capacities, support for higher user speeds, lower latency, greater network flexibility and lower costs for capacity – will give early movers considerable advantages. Others will have to follow or face painful share loss. 5G rollout will be more dependent on testing equipment. 5G introduces new technologies (e.g. beamforming, massive MIMO, etc. ), expands the useable spectrum, enables a proliferation of new cell sites (e.g. small cell densification, IoT, etc.) and supports high precision multi-GB links (e.g. residential broadband, wireless backhaul, etc.). This complexity will require more sophisticated testing in greater volume than in previous wireless network deployments. With this, we expect the upside in capex to drive even greater upside in spending on test equipment, particularly early in the buildout cycle. Test equipment trends favor larger suppliers. The complexity of the 5G rollout will amplify the architectural trend in test equipment toward modular hardware with greater emphasis on implementing solutions in software. Physical measurement modules slot into standard chasses based on the common PCI bus, and the data is analyzed on the system rather than directly on the instrument. This preserves value of the installed base hardware, which can often be repurposed with updated software, while somewhat commoditizing the market for new testing modules. 5G should counter this, as the expansion of spectrum in use and the physical issues in testing precise MIMO antenna arrays and beamforming will still require new investment in hardware testing modules. Overall, larger vendors benefit by offering more comprehensive testing software suites, crowding out smaller rivals that had historically focused on a single element of testing. Testing stocks have begun a cyclical rebound. A basket of the leading T&M stocks (KEYS, NATI, VIAV, Anritsu) is up 47.9% YoY, reflecting a general cyclical recovery after a few years of stagnant industry revenues. Recent quarterly results for these names have shown meaningful upside on earnings vs. consensus, with forecasts looking for sales acceleration into next year. Industry analysts project 4-5% annual growth for the overall electronic test market, with the communications segment growing at roughly double that pace. Given our expectation for better than expected 5G spending and for a relatively higher need for testing equipment within that spend, we think that there could be meaningful upside to current consensus expectations for the group. 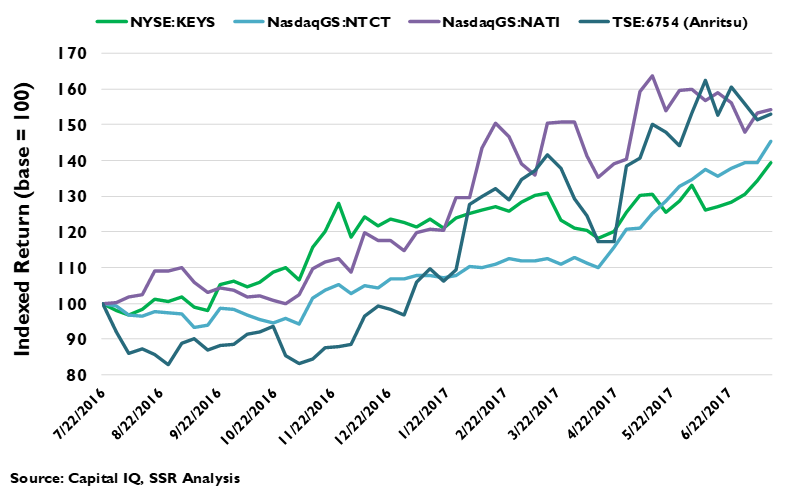 Our Large Cap Model Portfolio outperformed by 989bp since our last update. Very strong performance from portfolio constituents NVDA, NOW, WDAY and NFLX contributed to 10.2% appreciation since our last update in April, offsetting disappointing returns from IBM, MLNX, TMUS and QCOM. This beat the S&P500 by 981bp and the tech components of that index by 446bp. Given our view of the wireless network test equipment market, we are adding KEYS to the model portfolio. While it has risen more than 40% YoY, we believe that the valuation, at 15.7x forward EPS estimates is reasonable, and expect results to exceed expectations over the next several quarters. To make room, we are removing MLNX, which has been a poor performer in its time in the portfolio. Test and measurement is a bit boring. Oscilloscopes, signal generators, network analyzers, bit error ratio testers, and other instruments used to support R&D, to calibrate manufacturing systems, to monitor processes, and to set up and maintain communications networks. Wireless network testing makes up about a third of the $20B global market, with commercial mobile carriers the large part of that demand. Historically, demand growth has been modest and cyclical, with annual growth ranging from down a couple of percent to up in the mid-to-high single digits. Competition is also modest, market categories are fairly concentrated and getting more so, with generally healthy margins all around. The industry has been in a down cycle over the past 3 years, but recent quarterly results have been encouraging and share prices have risen roughly 50% over the past year. Nonetheless, the sector leaders remain below market multiples. We think 5G will yield upside for leading test and measurement names like KEYS, NATI, and VIAV. Many carriers – e.g. T, VZ, Vodaphone, etc. – have been talking down their expected CAPEX for the upcoming generational change, promising measured buildouts that can be accomplished without raising spending as a percentage of sales by very much. We believe that this is wishful thinking (http://www.ssrllc.com/publication/ 5g-rising-global-carrier-competition-to-drive-capex/). These carriers – longstanding leaders in their markets – have been under severe pressure. Subscriber share losses, ARPU declines, falling service revenues, and weakening cash flows evince a hard competitive reality. If one carrier decides to rollout 5G aggressively, the others will have to follow – dramatically greater network capacity, faster speeds and reduced latency are too potent as competitive weapons to yield to a rival. Economists call it a prisoner’s dilemma – if the carriers could collude they would all agree to forego the expense, but in competition, everyone will go all-in. Expectations for T&M companies embed a cautious view of 5G spending. 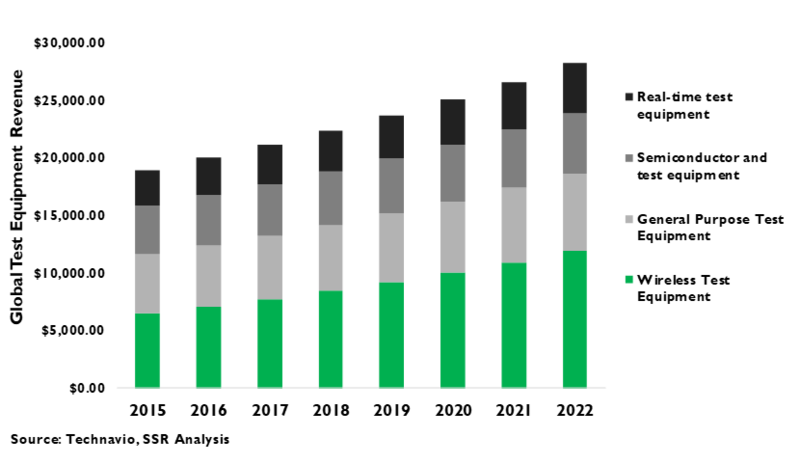 If we are right, and carrier competition forces them to step up investment, the T&M players with wireless exposure will be prime beneficiaries, particularly early in the spending cycle. 5G – introducing swaths of new radio spectrum and sophisticated antennae with both massive MIMO and beamforming – also seriously raises the level of testing required. This means upside to estimates starting in 2018. Within the T&M industry, there are other trends that will favor the current leaders. 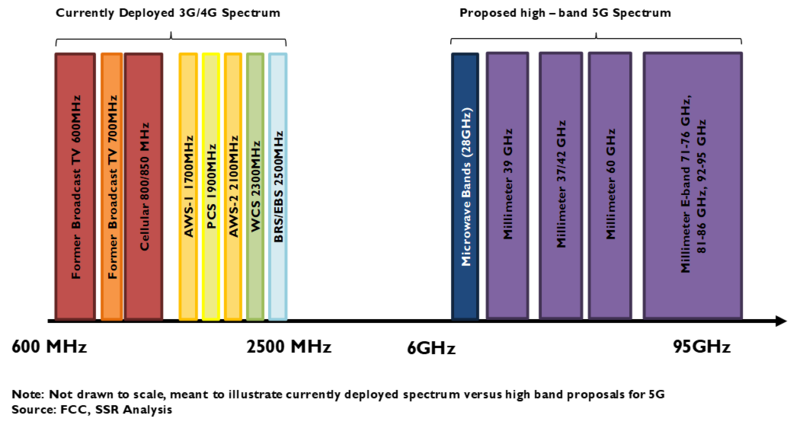 Modular architecture – measurement instruments become plug-ins to a standard PCI bus – shifts the value added from hardware to software, to the advantage of broad players offering comprehensive testing suites. In this context, we are adding KEYS to our model portfolio, replacing MLNX, which has been a poor performer since its addition. Overall, our portfolio has had a banner quarter, topping the S&P500 by 981 bp and the tech constituents of that index by 446 bp since April. 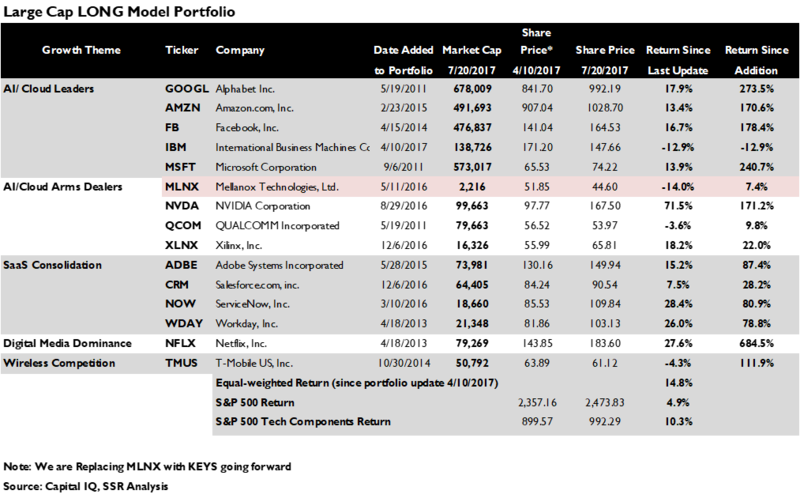 AI-driven upside in 1Q17 for NVDA made it the top performer amongst our picks, but SaaS stalwarts WDAY and NOW, and on-demand streaming pioneer NFLX were also big winners. IBM, MLNX, TMUS and QCOM were sluggards, offsetting some of our upside. IBM’s 2Q17 results were disheartening, but we are staying the course, as we are with TMUS and QCOM, both of whom we believe will be substantial beneficiaries of the 5G transition. Electronic test and measurement (T&M) is an old business, dating back to even before Mister Hewlett and Mister Packard began messing around in that Palo Alto garage. 70 years later, T&M is a roughly $20B annual market, growing in the low single digits against a cycle which has been down over the past few years. Analysts generally believe that the industry is due for an upturn, and boldened by improving quarterly reports, investors have taken the stocks in the group up an average of nearly 50% in the past 12 months (Exhibits 1-2). The reasons for optimism are several-fold. R&D in the electronics world is rising a bit, as device and equipment makers address new opportunities from home speakers, to drones, to self-driving cars. Likewise, the electronic content of many products is rising, driving complexity in manufacturing and demand for test systems to help keep manufacturing lines running. Hyperscale data centers need test gear too, for their networks and to keep their massive server banks within their operating parameters. 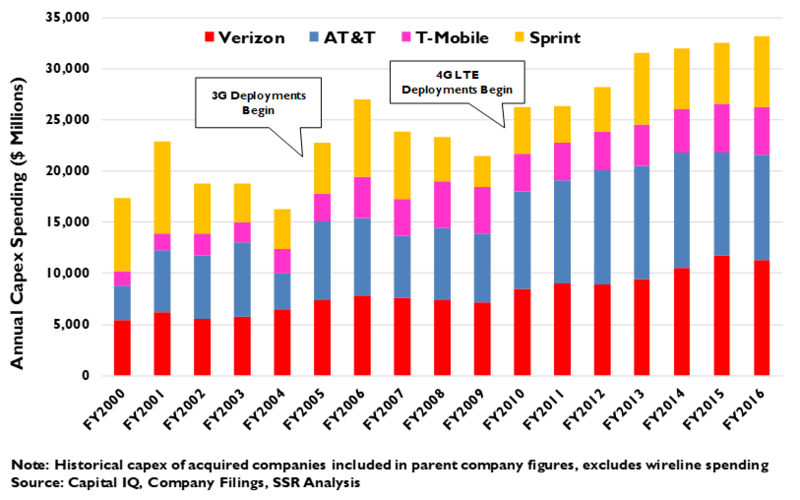 Still, the biggest demand category is wireless network testing, with most of that coming from commercial mobile carriers (Exhibits 3-5). Wireless network testing assures that each base-station is delivering the right signals to the right places, and that the network services work the way that they are supposed to. It follows then, that when carriers are building out new network capacity that they will need the appropriate testing gear to support the implementation. 5G is likely to drive disproportionate demand. It enables new spectrum bands far beyond the range of the installed base of testing gear. It introduces sophisticated new antennae technology – massive MIMO, beamforming – that will require unusual precision to implement. Network densification under 5G could yield an explosion of small cells to expand network capacity – these small cells need testing as well. Low cost IoT 5G network overlays could eventually support millions of fixed M2M connections – still more testing (Exhibit 6). Meanwhile, some of the leading wireless operators are saying “not so fast” to investors concerned for a bump in capital spending. 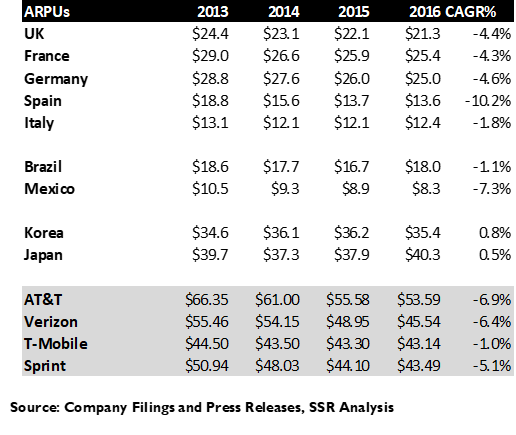 AT&T, Verizon, Vodaphone, and others suggest that they can accommodate a phased 5G buildout within their current CAPEX budgets as a percentage of sale by reducing their spending on the older network technologies commensurately. Even this scenario would be good for testing gear – the customers have ample equipment to support their older networks, but would need to spend to rollout the new technology. We see this “capex lite” scenario as fantasy. Telecom investors are worried about CAPEX because operating cash flows have been deteriorating. 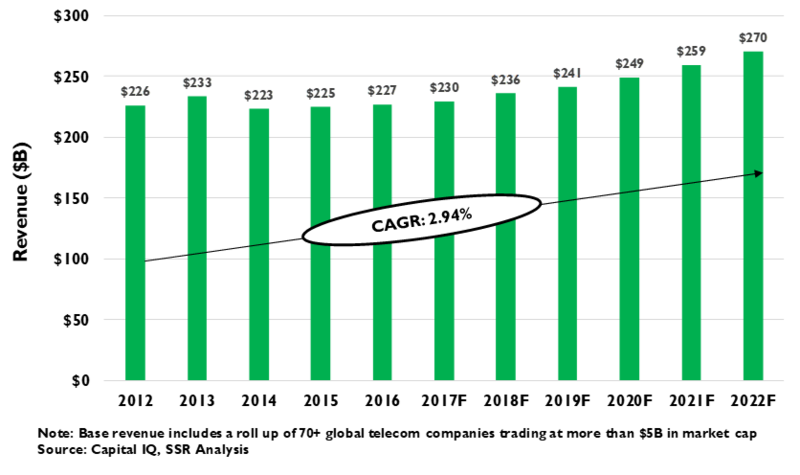 The cash flows have been deteriorating because leading carriers have been experiencing falling average revenue per user (ARPU) and, in some cases, share loss, which has led to weak sales against a massively fixed cost base (Exhibit 7-8). The ARPU and market share have fallen because upstart carriers have been able to use price and customer service levers to make major competitive inroads in many large global markets. 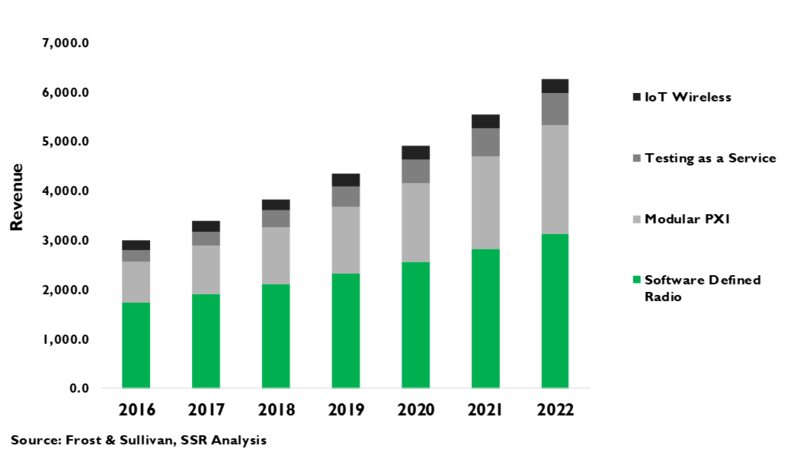 The upstart carriers have been successful because the criteria consumers use to evaluate wireless carriers have changed from “can you hear me now?” blanket voice coverage, to “do I get good data throughput in the places that I frequent” – the incumbent carriers may be at a disadvantage due to network congestion despite typically superior spectrum holdings. 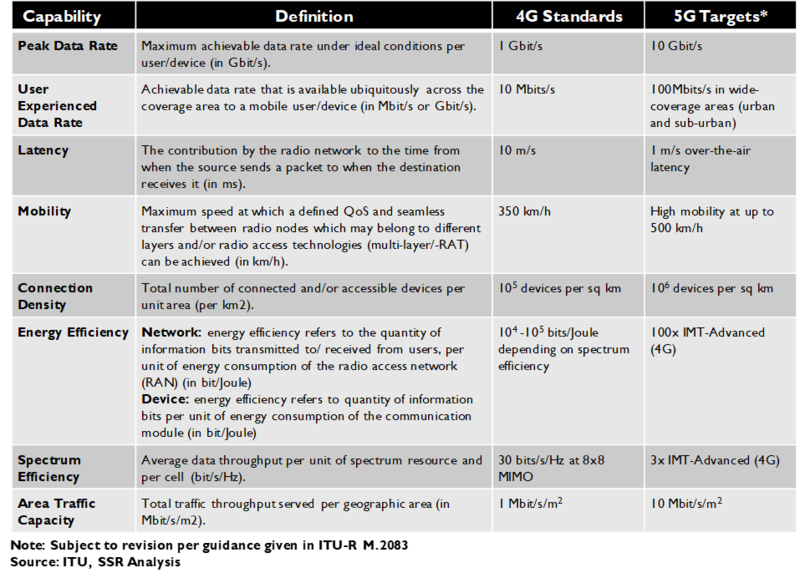 5G will give early movers considerable performance advantages vs. current networks – i.e. capacity, speed, latency, flexibility, and operating costs (Exhibit 9). 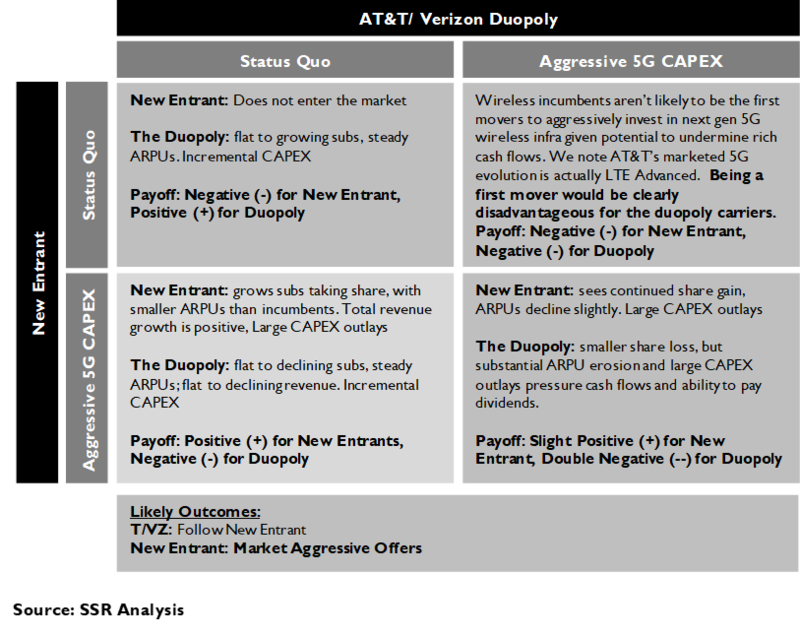 In this context, carriers might wish to conserve capital and slow-ball their 5G buildouts, but – in a fixed cost business where share loss and ARPU deterioration are so painful – if one of their competitors moves aggressively, they will have little choice but to follow. Worse still, if a new entrant gets ahold of spectrum and begins to build – a likelihood in the US, where Dish is searching for dance partners and Comcast and Charter have joined forces to do … something. This seems a classic prisoner’s dilemma where the best of intentions will inevitably run afoul (Exhibit 10). 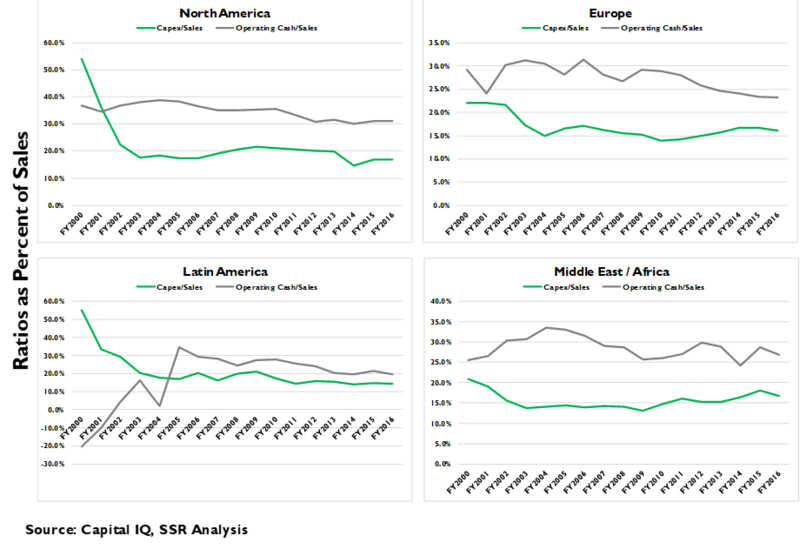 We expect global carrier capex to trend up more than 200bp as a percent of sales over the next 4 years. 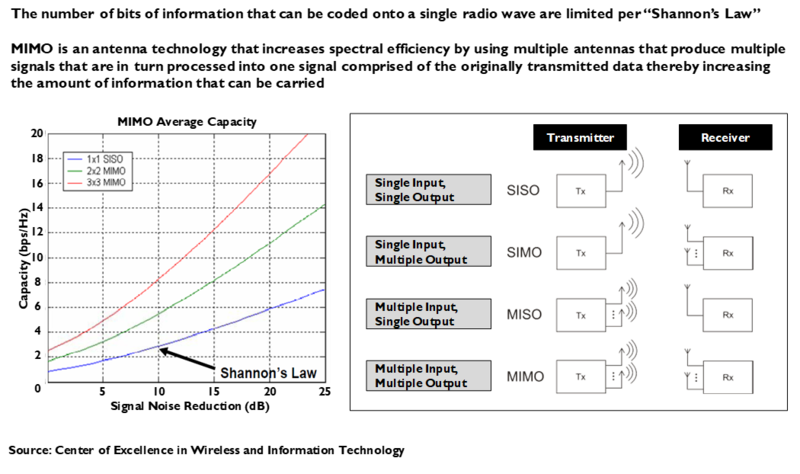 5G is a step function in network sophistication, introducing considerable challenges to T&M competitors – support for higher frequencies all the way to the top of the millimeter wave band, dense 128 element MIMO antenna arrays requiring precise testing for each element, beamforming antennae able to project signal into narrow physical footprints without bleeding into another sector, etc. (Exhibits 11-12). The top players – Keysight, Rohde & Schwartz, Anritsu, and National Instrument – have been investing aggressively and squeezing out smaller, would-be rivals. Industry consultant Frost & Sullivan projects 4.8% annual growth in electronic T&M sales going forward, with 7.25% growth in communications applications the primary driver. We believe that the sell side consensus for companies like Keysight and National Instrument embed similar assumptions, and predict meaningful upside from a more robust than expected global 5G rollout. Keysight, whose presumed 10% sales growth for 2017 and 2018 reflects its acquisition of data network testing firm Ixia, seems poised to exceed this consensus and trades at a modest 16.4x forward earnings. We are adding it to our model portfolio. National Instrument, which saw its R&D cut into earnings during the downcycle, appears to be another good bet. It is the leader in the shift to the modular architecture, and a mix shift to software should benefit margins as the top line accelerates (Exhibit 14). Our performance since our last update on April 14 has been very strong. Through Thursday, July 20, the 15 constituents are up 14.8%, 981bp ahead of the S&P500 and 446 bp ahead of the tech components of that index, a measure we use as our primary benchmark (Exhibit 15). 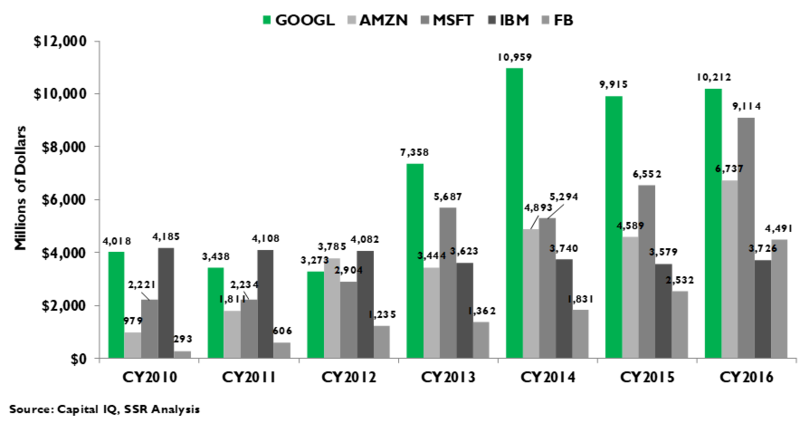 Performance was led by Nvidia, which punished its many bearish observers with a substantial AI-fueled 1Q17 beat. Our oversized bet on SaaS was rewarded, with particularly strong performance from Workday and ServiceNow. A sizeable 2Q17 beat by Netflix this week pushed that stock into our best performer list as well. Of course, there were laggards as well. IBM was our 2nd worst stock in its second quarter in the portfolio. While we still see the considerable value of its cloud business, weak performance in 2Q17 suggests that our hope for an early 2018 inflection point back to growth after 21 consecutive quarterly sales declines might be unrealistic. Nonetheless, we believe the upside opportunity outweighs the downside risk, Meanwhile, investors soured a bit on T-Mobile and remain frightened of Qualcomm’s patent dispute with Apple. We see both as big winners from 5G – TMUS can take a lot more market share, and QCOM’s deep experience in defending its IP licensing program gives us confidence. Mellanox is well positioned for generic switching solutions for hyperscale datacenter operators, but it has had spotty performance since we added it to the portfolio, down more than 13% this quarter, and could face new competitive risks. We are removing it in favor of Keysight.